After making 20 mini stockings for the Christmas cards I was left with the thought that next time it will just be hats, because there will be no heels to turn. They may have been tiny but the heels were the thorn in my side. 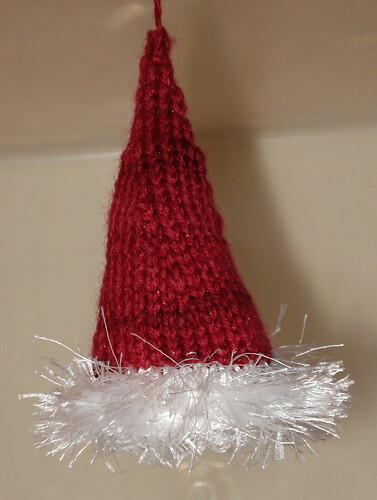 I whipped up this little Santa Hat as a test drive of my theory that it would be easier. It was. I also got to use fun fur which I kind of love but just cannot bring myself to knit with normally mostly because you just can't get away with wearing fun fur, especially in NY. 4 dp glove needles 4"
Fluff Fun Fir. This may involve gently pulling out the loose strands from where they have been caught in the knitting. Once you are satisfied you have gotten most threads loose, hold the hat over a garbage pail and snip fun fir threads to about a quarter inch. This is of course optional, I just found that the 1 inch fur was a bit too long. 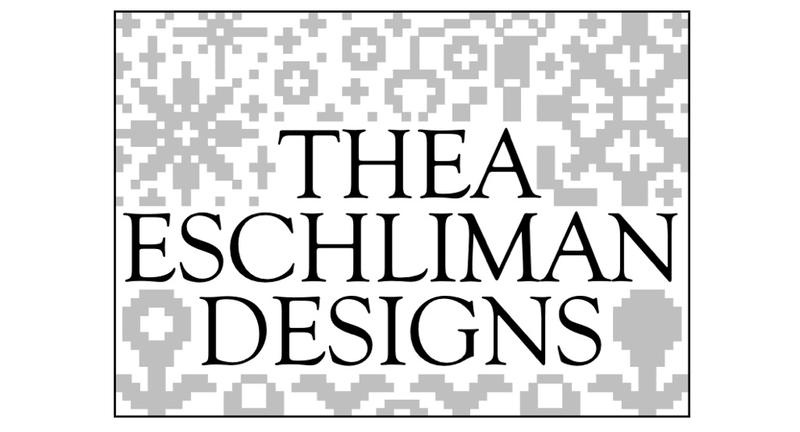 Now you can add something to the top, a handmaid pom or store bought one, or even a bell. I didn't add anything which is also always an option. Thread a cord through the tip top of the hat for hanging. 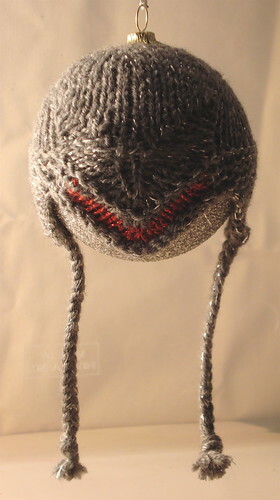 After making this hat I went a little further and made a mini version of the Cylon Hat. I don't have a patten for this since it was just a wing it using the original pattern. I used some Karabella Aurora 8 I have had lying around and a single silver thread. I went a little crazy at School Products a while back and now have large spools of sparkly thread, it's a bit ridiculous really, but seemed like a good idea at the time. The red is a cotton, metallic thread I got on ebay a while back. The ball is a glittery 3" styrofoam ball I picked up at Hobby Lobby when I lived in CO. I ripped out the metal hanger piece and reattached it after stretching the hat over the ball. Silly, but fun.